Will Scotland be richer than Norway after independence? When ordinary Scottish voters are asked whether they’d vote yes or no to Scottish independence, one frequent response is that Scotland is too small to be independent. I really don’t understand how anybody can believe this. Surely it must be a consequence of living in a big country and being used to comparing yourself with Germany and France. In reality, Scotland has a very average size for an independent country in northern Europe. Have a look at the graph on the left, which shows the population sizes of various northern European contries (it’s Scotland in blue). Of course Scotland won’t have the same influence as England, but similar countries such as Denmark, Norway and Ireland typically feel they have plenty of influence. I definitely don’t know of a popular movement in any country the size of Scotland that advocates joining a bigger neighbour because their country is too small to remain independent. Even very similar countries with a long shared history, such as Denmark and Norway, never seriously discuss becoming one country again. I agree with a big but. The only reason, none of those countries are too small is because of the EU. For example, Iceland recently decided to apply for membership of the EU, which could easily be seen as joining a larger country, because they couldn’t foot the bill after the fiscal crisis. From the list above, Norway is not in the EU, but is the richest country in Europe, and has a population of just under 5 million. True. I wouldn’t necessarily be recommending independence for Scotland if the EU didn’t exist. Two of the richest countries in Europe are Norway and Switzerland, neither of which are part of the European union. Switzerland has a population of 7 million, and Norway, 5 million. 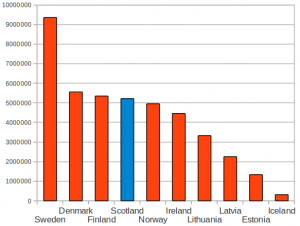 The reason Norway tops the euro rich, is because it has oil…just like Scotland, only Scotland has MORE oil. I still think it’s worth to take into account that the EU and NATO have helped to contribute to a Europe where the rule of law applies to countries, too, which means that small countries are intimidated or even invaded by the bigger ones, so in that sense, Norway and Switzerland are benefitting hugely from the institutions that they’re not members of.